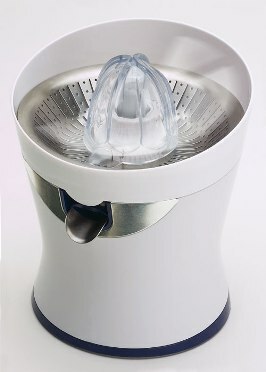 The Tribest CitriStar Citrus Juicer has proven itself to be one of the best juicers for citrus fruits in its price range. As soon as you unpack this juicer you will be impressed by its sturdy construction. The powerful 85 watt motor, self-cleaning ream, and sloped juice collector insures the very best juice yield without that annoying clogging problem. I personally love the locking spout, eliminating juice from dripping all over your counter. After juicing, simply snap the spout in place, and in a few minutes come back and collect the last remaining juice. Counter-Friendly: A citrus juicer is small enough that it has a far better change of remaining on your counter, which means a greater likelihood of actually being used. Ease Of Use: No peeling, you simply cut your citrus fruit in half, press down onto the ream and fresh juice pours into your glass. Cleanup literally takes half a minute. Just rinse three small parts under the tap. Affordable: No matter what income, everyone can afford this citrus juicer. A Sweeter Juice: Citrus juicers produce a very different type of juice then centrifugal or masticating juicers. Because the pith and membranes are not being pulverized, the juice tends to be less thick and a little sweeter. This is all about personal taste, but I often find myself in the mood for some orange/grapefruit juice from the citrus juicer. Very Quiet: This may not sound all that important, until you desire to make some fresh orange juice early in the morning while everyone is still sleeping. An 85 Watt Motor: Powerful motor for highest extraction results and quiet operation. Auto Start/Stop: Easy one-touch operation. Stainless Steel Locking Spout: Juice pours directly into glass for continuous operation. Locking mechanism prevents drips. Universal Ream: Allows maximum extraction from the smallest limes to the largest grapefruit. Stainless Steel Screen: Fine screen prevents clogging and is easy to clean. Cord Storage: Convenient adjustable cord length and easy storage. 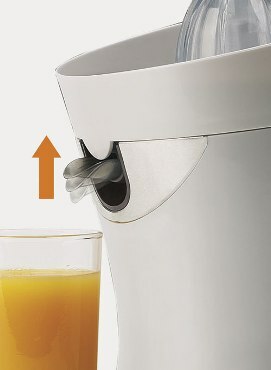 Sloped Juice Collector: Maximizes juice flow and eliminates clogs. High-Clearance Spout: Prevents clogs to ensure continuous operation.